I have found that using graph paper when drawing out graphs can be very helpful in crochet. HOWEVER, graph paper costs money, AND it can be difficult to find without going to an office store. If I can get away with going to the smaller store I will definitely do so! I also use excel to create the graphs I draw in my patterns. It looks MUCH more professional than a graph drawn in pencil and scanned in. Here is another way to use excel to do the same thing. Once you finish putting in your graph, you can highlight all the area of the graph and change the outline of the cells so that they show up nicely. 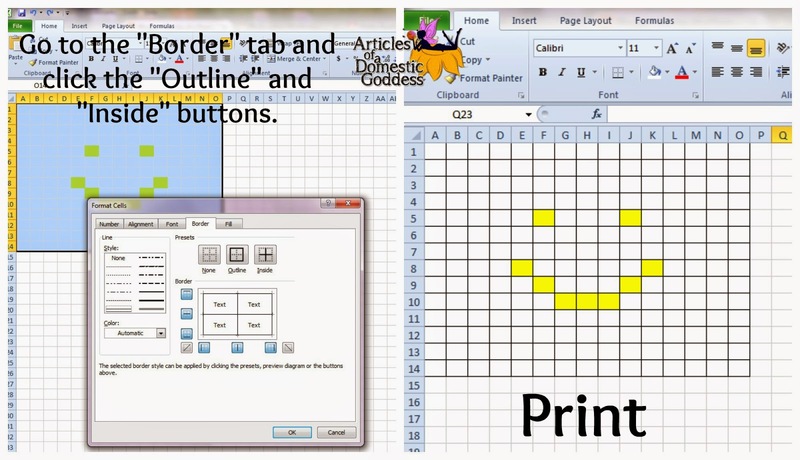 You can then print the pattern out onto paper, OR you can print the file to pdf. To print to pdf: Click File –> Save As –> There will be a space for “File name” and “File Type”. Name it as you wish, but change the file type to PDF. Now you can push save and Adobe (If you do not have Adobe Reader, download it here) will open up and you will have a beautiful copy of your graph! « National Crochet Month 75% off sale!